This page contains information about the various Marksmanship medals and corresponding ribbons, Distinguished Badges and application for award thereof, history about the individuals that specific trophies available for award to Navy personnel at the Fleet/All Navy, Interservice, and National matches are named in honor of, as well as recent news about the USNMT or its members . If you have additional information on any of these categories, please contact the USNMT webmaster. Sailors who fire qualifying scores in matches, or in qualification courses of fire, are entitled to wear marksmanship medals and their corresponding ribbons on their uniforms under Navy Regulations. A rifle ribbon/medal has precedence over a pistol ribbon/medal. Qualifications are categorized as Expert (with an “E” affixed to the ribbon), Sharpshooter (“S” on ribbon) or Marksman (plain ribbon) according to the Sailor’s score, based upon a percentage of the total points possible in the course of fire. 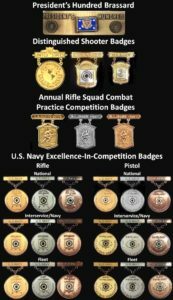 Military personnel and civilians who participate in Excellence-in-Competition (EIC) Matches can obtain Gold, Silver, and Bronze Badges worth, generally, ten, eight, or six points, respectively towards the 30 points required to become a “Distinguished Marksman” (Rifle, Navy and Marine Corps), “Distinguished Rifleman” (Army and Air Force) or “Distinguished Pistol Shot.” Generally, a competitor may participate in a maximum of four EIC matches during a year, with the stipulation that if he competes in four, one must be the National Trophy Individual Match during the annual Civilian Marksmanship Program National Matches, conducted by the NRA, at Camp Perry, Ohio. History of the Distinguished Marksman Badge (by Culver). History of the Distinguished Marksman Badge (by Rocketto). The Distinguished Marksmanship Ribbon is a military decoration of the United States Navy which was first created in 1942. Originally known as the Distinguished Marksman and Pistol Shot Ribbon, the decoration recognized those who had been presented a Distinguished Marksman Badge through exceptional scoring at a professional military shooting competition. The Distinguished Marksman and Pistol Shot Ribbon was issued for receipt of either a Pistol or Rifle Distinguished Marksman Badge. In 1952, the Secretary of the Navy ordered that the Distinguished Marksman and Pistol Shot Ribbon be divided into two new decorations, one for rifle distinguished marksmanship and the other for distinguished marksmanship on a pistol weapon. The new awards were known respectively as the Distinguished Marksman Ribbon and the Distinguished Pistol Shot Ribbon. The Distinguished Marksman Ribbon and the Distinguished Pistol Shot Ribbon were issued until 1959 when the Navy Department ordered the awards discontinued as of July 13th of that year. Attn: Mr. Patrick Marquez, Awards Section Code 09B, Washington, DC 20350-2000. See example letter here. If retired, use this template. Points are awarded as follows: In any EIC match, the top 10% of scorers, among non-Distinguished competitors, are awarded points, commonly called “legs” or “leg points.” A small number will be awarded Gold, a larger number Silver, and the largest number receive Bronze. EIC matches are held during the Atlantic Fleet Rifle and Pistol Matches, the Pacific Fleet Rifle and Pistol Matches, the All Navy Rifle and Pistol Championships; the Interservice Matches, the National Matches, and and at civilian shooting clubs throughout the country. Badges earned outside of the Fleet, All Navy, Interservice and National matches do not rate a Navy EIC badge, but count towards the 30 required points. See OPNAVINST 3590.26 at USNMT regulations/references. Navy personnel may wear Distinguished Badges, and/or Gold, Silver, and Bronze EIC badges on their uniforms, under Navy Regulations. To request to be issued a National or Interservice Badge earned send an email to mailto:usndistinguished@usnmt.org(more info located at “Contacts” ). By traditional practice, initiated by President Theodore Roosevelt, the President of the United States sends a letter of congratulation to the match winner. However, that tradition has not been kept up since President Clinton. USNMT (active and reserve) members who have made the President’s 100 list (for rifle and/or pistol) since 2007 are listed here. Michael Gorchinski Memorial Trophy: While serving as a crewman aboard the USS NEW JERSEY (BB-62), ETC (SW) Michael W. Gorchinski, USN, volunteered to assist the 24th Marine Amphibious Unit with a radar installation problem they were having at the Marine Barracks in Beirut. On the morning of 23 October 1983, he was among the 240 Marines, sailors, and soldiers killed by a suicide truck bomber. Chief Gorchinski, “Chief Ski”, was a member of the Operations Department aboard the NEW JERSEY and was with the ship’s advance re-commissioning crew in 1981. He served with the electronics division (OE) which was charged with overseeing the ship’s installation of new search radars and display equipment. In 1979, Chief Gorchinski was the National Long Range Rifle Champion at Camp Perry, Ohio; he was awarded the Canadian Cup. Chief Gorchinski was a member of the U. S. Navy Shooting Team (as it was known then) from 1973 to 1983. To our knowledge, he is the only Navy Team shooter lost in the line of duty. We remain deeply saddened by his loss. 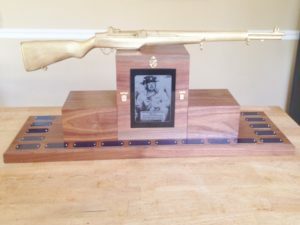 The award of this trophy was made possible through the efforts of Dave Fiechtner, CTOCS/CWO3 (Ret), USN 1958-1987, USN Distinguished Marksman 1975. The award of this trophy began in 2010. It is awarded annually to recognize the Grand Aggregate Winner of the All Navy Rifle and Pistol Championships (both East and West Coasts). A picture of the trophy is found here. Aviation Ordnanceman Chief (AOC) Donald McCoy (1920-2011) was a U.S. Navy Distinguished Marksman, a U.S. Navy Distinguished Pistol Shot, and a Gunsmith and Armor for the Navy Shooting Team (as it was known then). He is credited with developing the Navy M1 Mk2-1 Match Grade Service Rifle as the premier model of its kind. Many Navy men and women have won numerous National Board for the Promotion of Rifle Practice (NBPRP)/Civilian Marksmanship Program (CMP) matches, National Matches, Interservice Matches, and All Navy and Fleet matches, as well as NRA Regional Individual and Team matches. The award of this trophy was made possible through the efforts of Dave Fiechtner, CTOCS/CWO3 (Ret), USN 1958-1987, USN Distinguished Marksman 1975. The award of this trophy began in 2016. It is awarded annually to recognize the Navy (Active or Reserve) shooter with the highest aggregate score at the Interservice Rifle Championship. The trophy is pictured here: . Navy Admiral Willis A. Lee inducted into the USA Shooting Hall of Fame on 4 December 2015 in Colorado Springs. “In 1907, Admiral Lee became the only American to ever win both the open U.S. National Rifle and Pistol Championships in the same year. A 1920 Olympian, Lee was a member of the Rifle and Running Target team competing in 14 events and finished as the high medal winner for the Games, taking home seven team medals overall including five gold, one silver and one bronze. “Shooting everything from army rifle to miniature (smallbore) and running target, Lee was an ever-present fixture on the Antwerp medal stand,” said Col. Jim Crossman in his book, Olympic Shooting. Lee and his teammate Lloyd Spooner held the record for the most medals won at a single Olympics for 60 years. Note that Wikipedia describes (as of 9/30/17) Carl Osburn, CAPT, USNR, Ret., as the American having won the most Olympic medals (individual and team) until American swimmers Jennifer Thompson and Michael Phelps broke the record. Wikipedia does not have a page for Admiral Lee (as of 9/30/17). Carl Osburn was inducted into the USA Shooting Hall of Fame in 1994.